We’re releasing our ultimate tool to monitor and filter through assets. Our screener will tell you where the opportunities are happening, boosting your analysis speed, precision, profitability and drastically reducing your asset research time. Say goodbye to staring at charts for hours. With our screener, you will spend your time where it matters, which is executing your trades. Let our Spectrum Screener™ save you the time to find where the action is. Have you ever felt confused, lost, staring at the screen for hours? Often, you find yourself overtrading and making slim calls? Spectrum Screener™ will warn you when anything worth your while is happening so you can focus on what matters, the trading. The sky is the limit, you can track as many assets as your brain can possibly handle simultaneously before frying. YOU MUST RUN THE SCREENER ON POLONIEX:USDTUSD, THE THIRD OPTION. Because of Tradingview Platform malfunction we’re getting interference from the asset that the screener is running on, the problem has been reported to Tradingview already but you know how their support is…if you want full information about it just watch the full tutorial video – we disclose everything there. 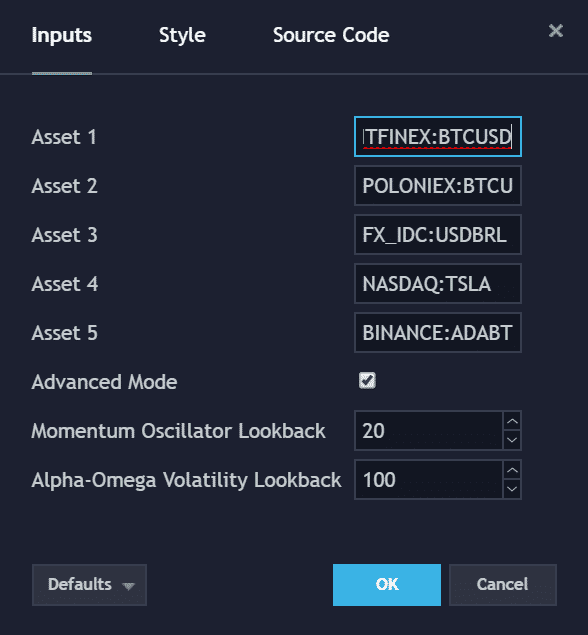 So you have to run on an asset that doesn’t oscillate a lot, and those assets are always close to 1, so it means that they won’t disturb your indicator, that’s the workaround we found so we don’t have to wait forever for Tradingview’s solution. If you already have a trading system going on, you just want to know when good moves will happen. That’s what our flex mode will do for you; it will keep it simple and point you where the action is. That’s the flex mode. As you can see it doesn’t display momentum it only warns you when a big move about to happen and if there’s a really strong bullish or bearish reversal reading it will display green or red circles. The red and the green balls are generated by the X Confirmation Algo, where the aqua attention circles are generated by the Scalper TA Algo. If your system is not so well crafted, we offer a powerful in-depth view with a lot of insightful information in the advanced mode. That will not only give you all the reversal warnings but also a proprietary momentum oscillator and our unique Alpha/Omega volatility index algorithm. This is our one of kind momentum oscillator, like anything else on the market we offer filtered and normalized momentum indicator that will display clearly where the trend is going but not only that, the colors also means the strength of the trend. Light Green: It means a strong and solid uptrend. Light Red: It means a strong and solid downtrend. Dark Green: It means a soft and weak uptrend, usually that is a correction and we observe those after during strong downtrends, where you see the green but it is still a negative momentum. Dark Red: It means a soft and weak downtrend, usually that is a correction and we observe those after during strong uptrends, where you see the red but it is still a positive momentum. Aqua/Blue: Just like the FLEX version this is the reversal signal, when the line turns blue you can expect bigger movements. Dealing with sideways markets is the problem of any automation fanatic. Those flat out markets that will just crush your bot with commissions. In order to fix that problem, we force our bots to only trade after our Alpha-Omega Volatility Index triggers a signal. This algorithm was create based on the Richter scale and how they use math to predict earthquakes, so whenever instability and volatility are coming you will get the ALPHAs and OMEGAs. As you can see they always appear BEFORE big movements, so after you see one of those you know that a big trend shift is about to happen, that’s when you want to trade, when you have the maximum volatility for maximum profits. Another important thing to notice are those red and green circles appearing on the very top and the very bottom of the oscillator, on the dashed lines, those are the X Confirmation reversal indicator, just like in the flex mode, if you have a green circle it means a strong bullish reversal signal, if red, strong bearish reversal. They are good to catch smaller corrections and bounces but they can’t spot large and powerful shifts like Alpha/Omega. So it’s important to know how to insert the correct syntax for your assets otherwise it won’t work. The syntax should be EXCHANGE:TICKER. If you don’t know how to find your correct symbol information, when you have it open on your chart, right click your chart -> Object Tree, it will be there. That’s pretty obvious, click it to use the advanced mode. That’s the amount of bars taken in consideration when the algorithm is calculating its signals. Watch the video for more info.